Made once but had marginal results. pg 17 I've had very good luck with this recipe, following it as it is and playing with the ingredients alike. If you want to throw this together as quickly as he does, you *need* fresh, flavorful ingredients and a high-quality broth. I tend to throw a ham hock in with the water and cook the veggies with the ham hock for an additional 30 minutes before adding the cabbage. I like kidney beans in my minestrone, so if I'm using them I;ll throw the ham hock in with the beans while they're cooking and use that cooking liquid as the base for this soup. If you want to keep it vegetarian, use a high-quality veggie broth and add the rind of the good-quality parm at the beginning. Also, get good parmesan! You don't need a lot for a good hit of flavor. Add some salt at the end to taste, and this minestrone is hard to beat. I keep coming back to this recipe. At first it seems like it will be too much rosemary, but it's not. We like this with some borlotti beans and only a little pasta, and homemade vegetable broth. Nice soup. I preferred cooking for 10 minutes instead of twenty, and not adding the herbs until the end. I love both leeks and chickpeas, but the combination was just like "erwtensoep", oldfashioned pea soup. Not my thing. Quick and easy soup to make. I just love anything with chick peas in. This is perfect for lunch on a cold day. All my children will eat this too which is a bonus! Agree with the previous reviewer, this is a very simple dish. Tasted nice enough but probably wouldn't repeat - too many other dishes to try! A very simple (too simple?) salad that has a lot of crunch! Pg. 37 This salad is not for the faint of heart. The anchovy and capers are a powerful combo, and the lemon juice cuts through very nicely. It's a great way to mellow the endive's inherent bitterness, but this recipe may not win over anchovy or caper haters. Great unexpected combination. Use fresh or high quality frozen peas. This salad was so appealing to me that I couldn't wait for fresh peas to come into market, so I used frozen baby peas, blanched for a matter of seconds, then cooled. It is hardly even a recipe, just a couple handfuls of baby spinach, a couple small handfuls of peas, toss with dressing and crumble feta on top. Jamie's dressing calls for an entire teaspoon of salt, too much, I felt, with salty feta. I actually just used a basic, unsalty, balsamic dressing. A lovely easy salad, can't wait to make it again with fresh peas! Pg 43 Shockingly good with endive. Very good on steamed veggies, chicken, and roasted brussels sprouts (this was an accidental discovery). Good basic pasta recipe (1 lb flour + 5 eggs). This is very nice, but I have not gotten to the stage where I could do it quickly yet. So, not an everyday thing. This had a very good flavor, but weirdly there was something very unsubstantial about it. Terribly written recipe. Talks about adding the mushroom liquor..hmmm I think you mean liquid. Great recipe and easy to follow. Liquor has several meanings and Jamie uses it in the right context. Liquid to which food has been added to or cooked in is indeed called liquor. I totally agree a fantastic dish. I used olive oil instead of butter and finished will a really good olive oil and great lemon oil instead of lemons and it worked fabulously. Fresh mushrooms from the farmers market were perfect and even added some baby spring greens. It will become a weeknight go to for us too! Pg 56. This is great! Use a mix of whatever mushrooms you find. If you have fresh pappardelle on hand, this dish seriously takes maybe 15 minutes with prep. With dried pasta it takes about 20-25 minutes. This is one of my go-to weeknight "date night" dinners because it plates beautifully, allows me to spend less time in the kitchen/more time cuddling, and tastes great with a salad on the side and a glass of wine. Nice recipe, mozzarella, prosciutto, basil and sundried tomatoes are always a good idea. 6.13 Yummy - would make a great entrée if required and have lots of time to prep. This is a LOT of work, but worth it. Lovely combination of flavours. Vegetarian, too. I already made my tomato sauce like this before I got the book, it's quite basic. But if you don't know yet how to make a good quick sauce from fresh tomatoes, this will help you. Nice shortcut. Basic but it works if you don't have a lot of time. We gave this 9/10: * Easy to follow recipe, with no complicated or ‘cheffy’ techniques * Nice balance of flavours and textures, go easy on the salad dressing * Great way to showcase beautifully fresh scallops so be sure to find a good local fishmongers if you can * This way of cooking Puy lentils will become a staple recipe for us, I’ve always felt Puy lentils were a bit overrated and never really understood what all the fuss is about. However, having braised them in the oven rather than cooking in a pan on the hob has opened my eyes! These were deliciously soft and moreish. The flavours were nicely balanced and, despite my initial concerns, the rosemary was not overpowering. I took the leftovers to work on Monday with some chicken and they were also delicious when cold. Easy and flavourful. It didn't develop much colour on the top in my oven but 1 minute under the broiler fixed that. May 03, 2014 This tasted better than I thought! I used a non-stick pan to pan fry the cod - I knew it was mistake! No crust on the fish but overall the meal tasted good. Quick and easy recipe with loads of flavour - perfect for a busy weeknight. I used cod which worked very well with the other ingredients. Great flavor combination and very easy to make. Big strong flavours. Well worth making the spicy couscous to go with it. This is great with an infusion of flavors directly into the leg. Far and away my favourite lamb shanks preparation. The gentle cooking in the oven allows for a decent amount of flexibility, I find - easy to just switch off the oven and let the meat stay warm in there until you're ready to eat. The flavours of this dish are superb. Brilliant with creamy, slow-cooked polenta. I don't roast whole chickens that often, but if I do I will probably use this recipe. It's a classic, and rightly so. I do prefer not to use parsley, as that has a tendency to become bitter when heated. Inserting butter and herbs directly under the chicken skin before roasting was a revelation for me. Pg. 120 This was one of the first cookbooks I tried out and bought when I started cooking over a decade ago. This recipe is responsible for making roast chicken less-scary (before I thought it took lots of work), and his suggestion to put herbs under the skin goes a long way to flavor the meat. In fact, that technique I use in almost all my roasted chicken dishes even if it's not called for. The chicken comes out juicy, the skin is crisp, and the flavor is dynamite. A good use for leftover chicken. The sauce tastes great. This should probably be called 'chicken with lime and some Asian flavourings' rather than posing as a green curry... But chicken with lime is still tasty! I just threw the curry paste ingredients into the food processor with minimal preparation (peeled garlic and ginger etc) and it worked fine, with the exception of the coriander seeds, which probably should actually be ground first as Jamie requests. That made it a pretty quick and easy meal for a weeknight. I served it with fresh rice noodles and lots of steamed green veg - a good combination. This is a lovely recipe, very easy and a great dish to do if you have not cooked rabbit before. For best results use a shallow dish so the rabbit does not sit on top of each other and only cook for the 10 mins he suggests. The Roasted Red Onion with Thyme and Butter as a suggested accompaniment was lovely also. My husband who is of italian descent thought that these were mediocre. I like Marcella Hazan's recipe much better. I thought these were delicious. My husband was not a fan of the mozzarella but my son and I loved it. I don't know Marcella Hazan but now I want to try her recipe as well based on what fprincess said! 5.14 Didn't add optional - scrummy. This is a good one. Once you've prepared the artichokes, it's ready in 15 min. I used lemon confit instead of the zest & juice and it's was very flavorful. I made this to balance the sharper tastes of the Sicilian roasted fish, reviewed above. It's just regular mashed potatoes with added parmesan and truffle oil. I also drizzled a small amount of truffle oil after plating. Very yummy. I bought extra potatoes and made a larger amount than we required, with the idea of crisping them up in a skillet and adding them to a frittata in the morning. No luck, not a bite of potato left over. It's nice to have a good old fashioned comfort food with a little upgrade. Of course, I could probably eat clay with truffle oil on it. I liked the flavor boost from the lemon & anchovy butter. This is tasty and simple. I liked the combination of soy sauce with lime & ginger. A nice and simple way to prepare bok choi and those other greens you don't really know what to do with. Nice and light, with a clear 'Chinese' flavor. I also added some diced chicken right at the beginning to make it more substantial. This worked well. Pg 147 I have this nasty habit of getting super excited by baby bok choi and other cool-looking greens at the farmer's market/grocery store/Korean mart, buying a few bags full because, darnit, I'm going to eat GREENS this week, only to proudly march home and realize I (still) have no idea how to make greens taste as exciting as they look. This recipe has saved me on more than one occasion because it;s simple and quick, but very flavorful. I frequently plop this on whatever grain I have made and some dry-fried marinated tofu. If you're like me and sometimes do weird things with leftovers for breakfast, you'll be happy to know that they taste great with poached/fried/soft boiled egg or two on top. The greens keep well for the next-days lunch, and they also taste good straight from the fridge. 9.13 Scrummy - just don't overcook. Lazily, I used precut butternut. I am sure this is nicer if you include the skins. Not totally convinced by the fennel seeds, but then I am not a big fan of aniseed. Mfto- I heard a tip for safely cutting butternut squash. Prick it with a fork and microwave it for @2 minutes then let cool. This will loosen the skin making it easier to peel. Once it is peeled it is easier to cut. I have done it this way for years. Otherwise my husband insists on cutting it so we don't have to make a trip to the Emergency Room. p 148 This is so easy and so delicious. Use a 2 to 3 lb butternut squash. Cutting the squash is the dangerous part for me. I followed Jamie's cutting instructions but as he says you can hack any way you please. Unfortunately my squash was too young and wasn't sweet but the flavoring was great. He says you can also use acorn squash. I have made this twice now and am thinking of trying the spices on sweet potato. My husband really like this and he is not an easy sell. If you've never roasted squash, this is a very good recipe to start with. It's simple and it's very tasty. Very simple, very tasty. I also like to put some parboiled potatoes (boiled 10 to 15 mins) in with this. I thought the roasting time given was a bit short. Pg. 153 Made these last night to go with a pork roast. Luckily, my partner loves cooked onions (my mother's response when she heard what I was planning: "who thinks to eat straight up onions as a side dish?"). Simple, easy, tasty. I agree with the other poster that I think the roasting time was a bit short, but I think that may have something to do with how truly vague measuring an onion as "medium" or "large" is (I can frequently only find red onions that are larger than my fist). I'll probably boost up the temp to 425 next time I make this. Simple. Seasoning at the end is essential, especially the red wine vinegar. Nice and different. I thought it was best cold. Pg 170 One of the first recipes I tried when I initially got into cooking a decade ago, and still my go-to for risotto, although I have it memorized by now. This recipe gets five stars because it's a fool-proof master recipe for that is well-written and very descriptive on what you need to look for at the different stages of cooking risotto. It gave me correct and tasty results back then as a novice, and I often send this to friends and family members when they want to learn how to make risotto. With this as a base you honestly have the ability to take this recipe to dozens of combinations. 4.14 Needed extra stock - 1 cup. Yummy - had with Spicy Squash. 3.15 Mushroom - scrummy. Very good risotto recipe, more flavourful than some with its use of shallots, garlic and celery. Next time I'll try it with the suggested vermouth (instead of white wine). Makes a huge amount, easily enough to feed 8. Not sure what a cranberry bean is, we used borlotti beans as listed in the book. Totally delicious, but much more suited as a winter dish. I made two pots, one with quorn veggie bacon for the hubby and one with pancetta for me. I actually think the veggie bacon was better! Will be making this one again as soon as the nights draw in! Absolutely delicious - will make it again. It seemed like a lot of rosemary, but it worked beautifully. We used tinned borlotti beans and streaky bacon. I baked pancetta in the oven until it was crispy and topped the risotto with pancetta shards. This was nice, but I had expected more with all Jamie's enthusiasm about the recipe. Maybe I used the wrong kind of beans, the Dutch translation says borlotti beans. Classic mushroom risotto. I use dry mushrooms from Trader Joe's when I don't have fresh ones on hand. Pg 175 Very good results using fresh or dried mushrooms. I tend to use fresh and use closer to 12-16oz of mixed mushrooms (baby portobello and regular white button) because, well, I really like fungi and I still get sticker-shock over the prices of dried shrooms. 4.14 Substituted mascarpone with sour cream - scrummy - good kick - made heaps. A perfect spring dish. I substituted fiddleheads for the asparagus, cooked them separately and added them just at the end to be heated through but otherwise followed the recipe. The risotto recipe that serves as the base has great flavour on its own; the addition of spring vegetables and mint makes it even better. I skipped the butter added at the end of cooking. 9.13 Yummy - had with lamb stew but didn't steam - just added stock to pan and let sit. This is my favorite way of making couscous. It tastes so much fresher than steamed couscous, and there is no danger of overcooking it. It's very versatile too, you can use so many different ingredients once you get the hang of it. I usually make it without all the vegetables, or with just one vegetable. The base is delicious but I think the topping would have worked better with a little more olive oil mixed through. The base focaccia recipe is amazing and works really well with the potato topping. Good and feasible if you don't have an ice cream machine. Sorry Jamie. This is forgettable! Relatively? heart smart chocolate fix. Can substitute orange juice for milk in the sauce to enhance the choc/orange hit. A new Winter favourite! So simple and so lovely. A real storecupboard recipe: with this recipe you can always make dessert. I always halve the amount of crumbs given. When making a rhubarb crumble, use a lot more sugar, about 8 to 10 tablespoons. Simple and delicious. I've even used frozen fruit, but do drain off most of the liquid from thawing. If there is extra topping, it keeps great in the refrigerator for later use. This is my go-to sweet pastry recipe/method. I always make double the amount suggested and freeze the rest. It defrosts quickly and I love his method of slicing the pastry into thin rounds and pressing them into the tart pan. With that much sugar it would be difficult to roll out, though plenty of recipes expect you to! I love lemon tarts and this is a nice version. I haven't made this tart in a while but it's very nice. I typically use heavy cream or creme fraiche instead of the sour cream. Very nice tart and simple too! A very nice tomato sauce, with a kick (thanks to the dried chillies). 5.14 Didn't add chilli for kids - scrummy. Okay. Nice, but I know better ways to prepare leeks. Naked It's not him - it's the food! Jamie Oliver - a.k.a. 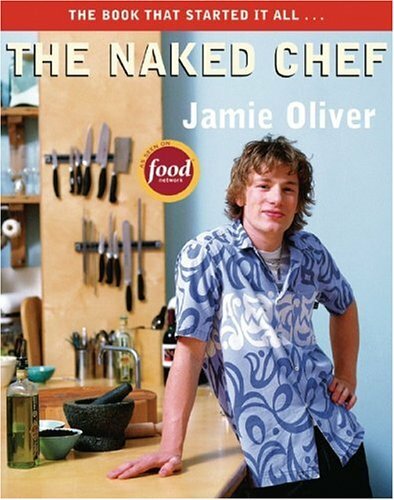 the Naked Chef - is England's #1 bestselling food sensation, a charismatic, streetwise culinary wonder boy whose personality is as fresh and unpretentious as his cooking. In this extraordinary cookbook, Jamie takes all of the trade secrets he has accumulated since he started cooking at age eight and distills them into a refreshingly simple style that really works for people who are passionate about food, but don't always have a lot of time, money or space. Jamie has applied his strip it bare then make it work principle to all his meals - from salads to roasts, desserts to pastas - and has created a foolproof repertoire of simple, feisty, and delicious recipes that combine bold flavors with fresh ingredients. With more than 120 no-fuss recipes, this book, a sumptuous feast for the eyes as well as the stomach, is modern cooking at its best.